In 2017, the Caring Ambassadors Program responded to the correlation between the opioid epidemic and rising HCV infections. New HCV infections rose 233% between 2010 and 2016, and it’s estimated that 70% of new HCV infections are among people who inject drugs. The Caring Ambassadors recognized that the HCV and opioid syndemic represents a looming public health and economic threat to our country. Based on this, and simultaneous inspiration from the book Dreamland, written by Sam Quinones, the Caring Ambassadors Program convened our first Syndemic Roundtable comprised of 25 multidisciplinary professionals and stakeholders to respond to the opioid/HCV syndemic in San Diego during the winter of 2017. Roundtable participants showed enthusiasm and interest in educating politicians on the syndemic, and therefore convened a second roundtable in Washington, DC during the summer of 2018.
book he coined the term ‘syndemic’ by combining two words to make a new meaning. Our inspiration. 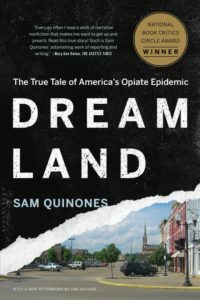 The staff of Caring Ambassadors Program read Dreamland and immediately knew we needed to reach out to the author, Sam Quinones. Upon talking with Sam, Caring Ambassadors was motivated to bring different groups of people together to share knowledge, and perspective to discuss the syndemic in a roundtable setting. Thus began, The Syndemic Roundtable: Opioids & Hepatitis C.
The participants of the first Roundtable in San Diego showed interest in educating their elected officials on the syndemic. Taking their feedback into consideration the Caring Ambassadors convened the second roundtable in Washington, DC during the summer of 2018.  Care and Treatment: Work around improvement, expansion of, access to, and systems integration.  Communications: Messaging and media efforts, priority areas, and communications strategies to educate, raise awareness, and combat stigma.  Policy: Keeping abreast of syndemic-related legislation, suggesting and/or organizing advocacy and lobbying opportunities, identifying policy gaps or policy opportunities to combat the syndemic.  Planning: Strategic planning for sustained growth of the coalition.  Data: Advancing data collection and surveillance efforts to highlight the syndemic’s impact, developing relevant fact sheets and infographics on societal and fiscal impact.